Merging two disks to one? I installed MacOS on disk 0. I have one HDD drive which is split into multiple disks. Now I would like to merge disk 0 and disk 1 (same hdd) to one disk. Is it possible and what should I do? For illustration I have added a screenshot with the current partitioning. You can use Disk Utility. But, if you intend to merge two partitions, both containing data, relying on a software process which cannot be undone (sans great expense, difficulty, and uncertainty)... you are braver than I am. If you want to run any Erase security options, you are better off running them on each partition BEFORE deleting each. But, if the HDD is a SSD (or FLASH), I believe those options are irrelevant. Wherever you see "APFS", that volume is on a SSD (using MacOS 10.13 or later). But, I have never attempted to use a bootable installer partition for "additional storage"; may not work, or have unexpected results. Obvious, but it's gotta be said Back Up everything first. Looking through DiskUtil's Man page, I can't find a way you could do it without erasing both disks, so if you are wanting to just expand the installation on disk0 to envelop disk1, you'd probably be looking for some proprietary software to do it and I'm not even sure there would be anything out there capable with APFS (and the first page of a quick google search turned nothing up). The mergePartition verb for diskutil sadly only works within one disk, not across two disks unless they are already joined together in an AppleRAID, CoreStorage or an APFS container. 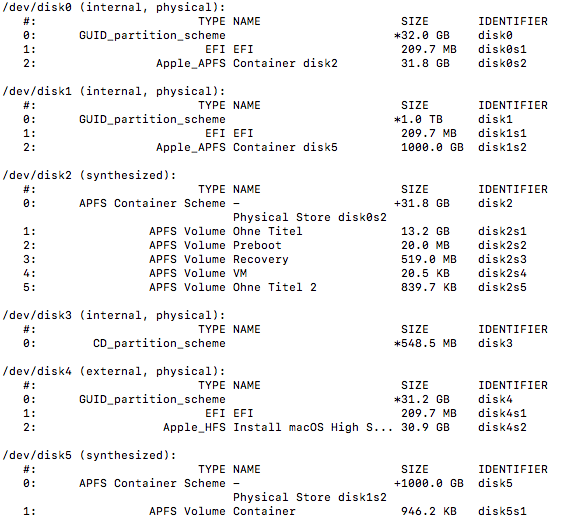 If you don't mind erasing the disks and restoring your backups after the fact, then you can either run diskutil resetFusion, which will grab the two internal drives and set them up as a Fusion Drive configuration, or you can run diskutil APFS createContainer disk0 disk1, after which you will need to look up which "diskx" the new APFS container is, and then run diskutil APFS addVolume diskx APFS "Macintosh HD"
If you're using Time Machine for your backups, it should happily reinstall macOS and restore all your applications and data in one step for you. Just start up from the Time Machine Backup disk when you start up the computer, use diskutil on the internal drive from there, and then select "Restore Backup" from there instead of "Reinstall macOS"
Not the answer you're looking for? Browse other questions tagged hard-drive partition merge . 2 Disks with the same name, how do I delete one?